WORTH THE HYPE? AMBIENT LIGHTING POWDERS - CRUELTY-FREE BECKY. At £38 a pop, these Hourglass Ambient Lighting Powders are certainly are not cheap. They are pretty famous in the beauty blogosphere with everybody in on the beauty world seeming to have mentioned them at some stage. As one of the only luxury beauty brands that is completely cruelty-free (take note y'all), I am more than happy to write an entire post dedicated to just these badboys. At such a high price point, you want to be as in the know as possible before purchase, so I thought I would give you my opinion on the powders and whether or not they are worth the hype they have received. A pale yellow with reflects. This is a nice powder to set the under eye area (yellow counteracting blueness and all that) and the reflects in the powder helps to brighten any dullness or eye bags you may have. Always a useful tool to have. A neutral peach beige. The finish of this differs from the other two shades I have in that there are no glitters in it. Instead, it has a lovely satin-like finish. 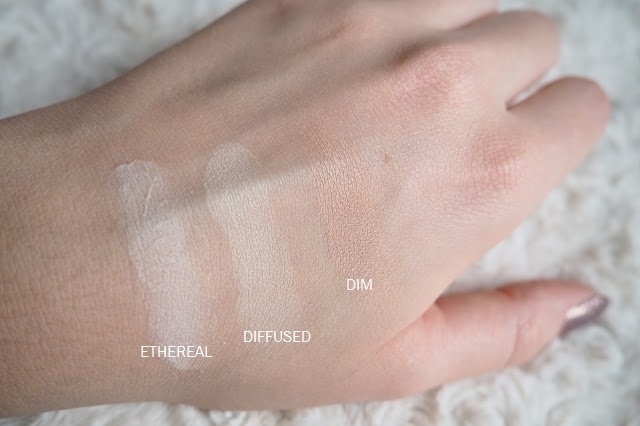 I mostly use this shade for contouring/bronzing/adding a bit of colour to my otherwise ghost-like complexion. It's a very subtle beige and probably only works on me because I am so very pale. If you too are very pale, or if you just find find traditional bronzers too strong or orangey for your skin tone, then I would very much recommend giving this a shot. A sheer, cool white powder. This is the shade I use as a subtle hightlight for an inner corner highlight/on the highpoints of the face/all that jazz. Similar to DIFFUSED LIGHT, this powder has little teenie reflects in it to bring light to the skin and brighten - but not an obnoxious amount of glitter and also not chunky or harsh. Super duper smooth and conveniently pretty difficult to go overboard with. I can agree with this. The nature of the product almost airbrushes the skin - like a pore filling primer in power form. Also, the shades are such so that strategically placing ETHEREAL LIGHT at the top of the cheekbones and DIM LIGHT in the hollows of the cheeks gives an awesome sculpted shading effect. If neither warm-toned bronzers (like Estee Lauder's Bronze Goddess) nor ash-toned contour powders (think Kevin Aucoin Sculpting Powder) work for you - DIM LIGHT just might. Pardon the accidental rhyme. Yep, there is definitely a soft-focus, luminous effect when these are applied to the skin. Tick. Hmmm, I'm a little weary when companies use phrases like 'cutting edge technology'. Usually I see it as nothing more than a marketing ploy, but a micron is a really small measurement (roughly 254000th of an inch), so I guess this claim could have some truth to it? The powder is majorly fine and silky for a pressed powder - I feel like this is as close as you are gonna get to a loose powder in pressed form. I'm not sure Hourglass can target every skintone with just 6 shades, but hey, who knows. Not sure how confident I am about the youthful appearance part of this claim either, other than the radiance effect and airbrushed smoothing of fine lines which may also reduce the appearance of wrinkles. I can get on board with this claim. I myself have never been a fan of heavy duty/obvious powders (like Rimmel Stay Matte), but I have a naturally combination complexion, which makes something like this perfect for me. OK, so let's get critical. There aren't many negative aspects to these guys I have to say (bar the ridiculous price tag). The lightweight packaging doesn't feel all that luxury - but then again, anything heavier or more robust may have been less travel friendly. I have to say that I'm not sure that the shades will work for deep to dark skin tones - or at least, not in the same way as I have described that I like use them. For instance, DIM LIGHT may work as an all over setting powder rather than a contour. You could still make it work, just tweak the usage and targeted areas. If you are not a fan of powdered or flat-matte skin but need a little something-something to set everything in place, I would definitely recommend trying these out in store. These products are the watercolour paints of the powders on the market - subtle, understated and equally as beautiful. I honestly think that the multi-purpose nature of the product, the longevity (both on the skin and in the pan) together with the unique air-brushed effect it gives the skin makes it worth the 38 squids. It pains me to say it, but I will definitely be repurchasing in the future.